Residual chloramphenicol, crystal violet and other illegal drugs in fish pose potential health risks and adverse impact to the aquatic environment, and are important concerns of consumers and regulatory agencies. Surface enhanced Raman spectroscopy (SERS) with two different types of SERS-active substrates were used to collect the spectra of chloramphenicol and crystal violet over a concentration range of 10 ng/mL to10 μg/mL. Partial least squares regression and multiple linear regression models were developed for quantitative prediction of these drugs from their spectral data (n = 32). 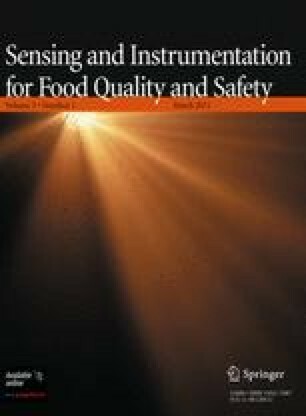 The limit of detection for chloramphenicol and crystal violet was 50 and 20 ng/mL, respectively, and R2 values of chemometric models were from 0.82 to 0.87, indicating potential of applying SERS for determination of trace amounts of prohibited substances in food. This research was supported by the Science and Technology Commission of Shanghai Municipality (Project # 09PJ1405200 & 09320503800). Additional support for this research was provided by the Leading Academic Discipline Project of Shanghai Municipal Education Commission (Project # J50704) and Shanghai Ocean University (A-2400-09-0145). Special thanks go to Dr. Yan-liang Zhang in Thermo Fisher Scientific Inc. for his technical support.